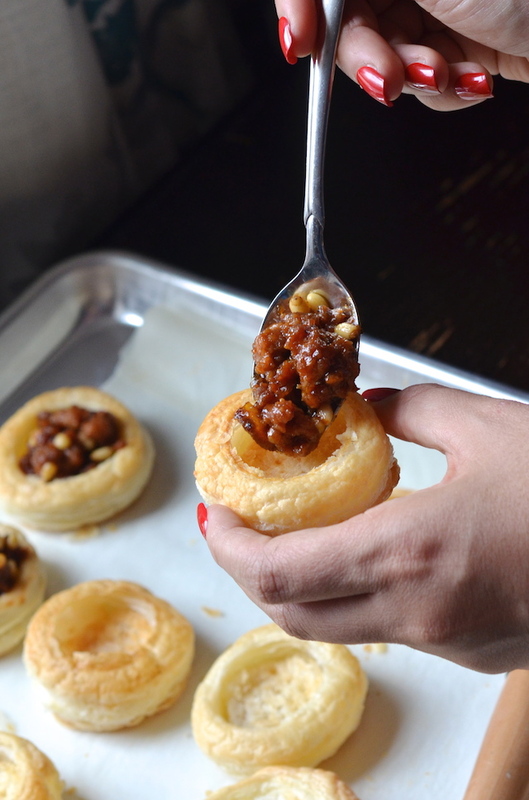 Few things make me giddier than party appetizers. Puffy little spicy things. Or salty things. Or cheesy things. Or filled with meat-y things. They remind me of the frozen mini puff pastry appetizer trays my mom used to buy and bake for holiday parties when we were growing up. There were little spinach triangles and sauce something-or-others. I'd hang around near them from the minute they came out of the oven to when the leftovers were being put away. Hot and puffed, they'd burn my fingertips and my tongue, but were fantastic. Throughout the party, I'd make a point of drifting by, filling up a plate or my hands with 2 or 3...all casual, casual in my poofy party dress. My mom telling me to stop eating them all. I'd deny it, though the flaky crumbs on my bodice always gave me away. 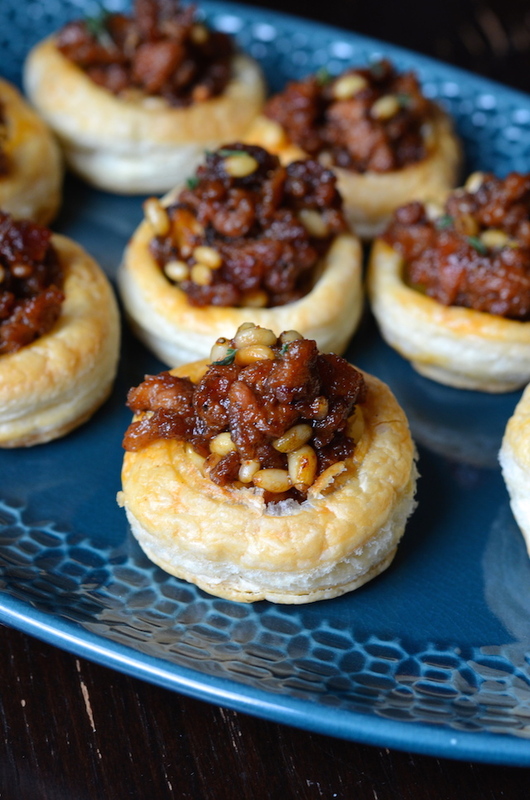 These Puff Pastry Shells with Chorizo, Dates & Pine Nuts bring that all back. 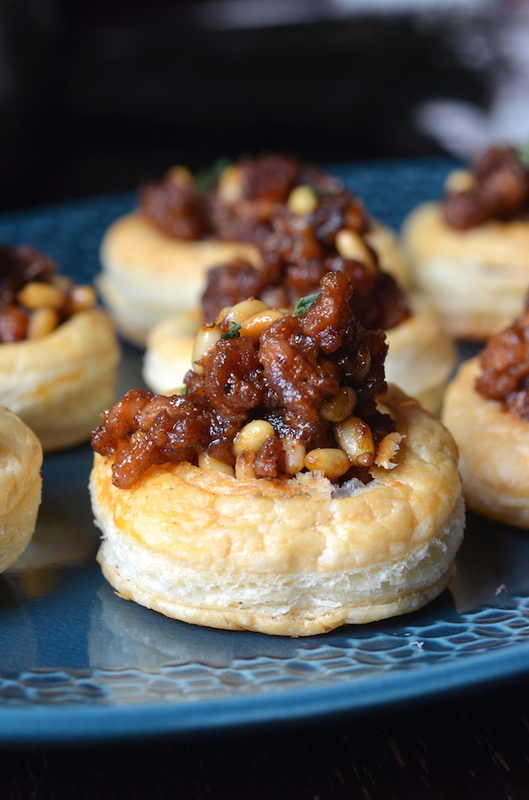 The perfect easy party appetizer, they're like a slightly fancier version of those store-bought ones. The shells you can buy frozen, or even make your own (super easy, and kind of super fun, too). Then the filling you just saute for a couple minutes and boom! Done. The flavors here are total Spanish tapas-inspired: Spicy chorizo sausage. Sweet dates. Crunchy, slightly meaty pine nuts. And, like always, you can totally customize these to make them your own or to fill out the appetizer tray. Some Ideas: Swap in spicy Italian sausage or a Moroccan merguez made with lamb. The pine nuts could easily be replaced with chopped almonds, walnuts or hazelnuts. The dates? Try apricots, cranberries or classic raisins. 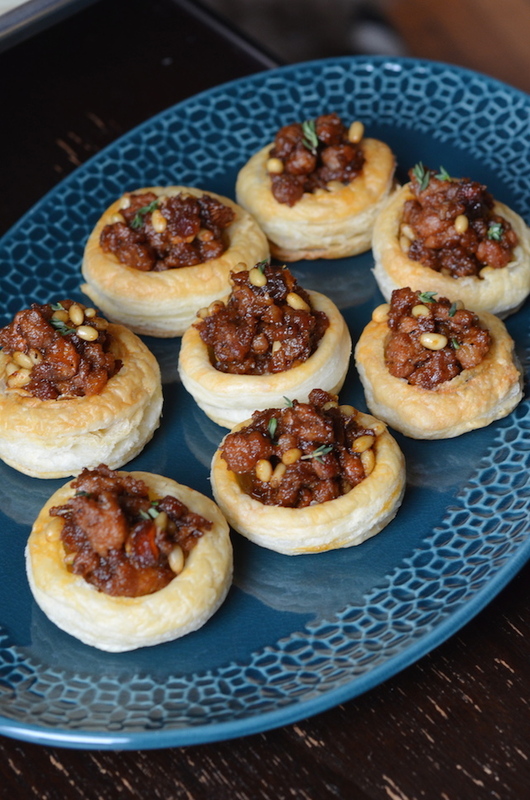 Frozen puff pastry shells are baked then filled with an easy sweet and savory filling that’s reminiscent of Spanish tapas. The chorizo filling can be prepared up to 48 hours in advance, and then reheated just before assembling and serving the appetizers. Bake puff pastry shells according to package directions. Push in or remove the centers to create a well. Remove chorizo from casing, crumble into a saucepan over medium heat, and cook until browned. (If your chorizo is not very fatty, you may need to add 2 tablespoons of olive oil or other fat to the pan.) Add the smoked paprika, dates, beef stock, and sherry, and bring to a boil. Lower heat and let simmer 3-5 minutes, or until liquid has reduced and turned into a glaze. Stir in the pine nuts. Divide filling into baked puff pastry shells, and garnish with a sprinkle of thyme and flaky sea salt.